Alternately fascinating and frustrating, Overexposed shows the band truly excited for their big pop closeup, trying tons of new things and failing spectacularly about half the time. Worth a listen, but a classic this is not. It's truly amazing to think that there was a time when Maroon 5 were not considered pop enough. However, that's exactly what happened in 2002 when the young, Adam Levine-fronted band known as Maroon 5 turned in their first post-Kara's Flowers album, Songs About Jane, to their label, who insisted that they didn't hear a single in the batch. Upset and angered, the group turned in "Harder to Breathe", the hardest-rocking song the band has ever done (to date), and lo' and behold, it was not only their first single, but also their first Top 40 hit. Once they were in the pop consciousness, they pretty much never left, as what followed was a non-stop series of charming yet inoffensive pop staples: "This Love", "She Will Be Loved", the surprisingly soulful "Sunday Morning", etc. Despite all the frustrations the group felt from the start, success was proving to be remarkably easy. In fact, it was almost too easy. The band released two more albums -- the long-delayed (and horridly-titled) 2007 effort It Won't Be Soon Before Long and the limp 2010 disc Hands All Over -- but it was obvious that despite scoring their first chart-topper with "Makes Me Wonder", there was something missing with the group. Their easy everyman charm got lost in sleek pop productions, and despite the Rihanna collaborations and somehow thinking they had enough "undiscovered classics" to make an album of B-sides in 2007 (and a remix album the year after), Maroon 5 were beginning to lose their way, which the band blatantly acknowledged in interviews about the lack of sales for Hands All Over (that album's second single, "Give a Little More", toppped out at a downright embarrassing No. 86 on Billboard). Then, came freedom. Gauzy, disposable, Christina Aguilera-assisted freedom. And because of that freedom, we get the wild curiosity that is Overexposed: as fascinatingly flawed a pop album as any group has made in recent memory. We all remember what inspired that freedom: "Moves Like Jagger". The song got overplayed like hell, but damn if it wasn't expertly crafted, that whistled hook burrowing in your brain for hours on end. It was launched on The Voice, the show which turned Levine from Handsome Frontman to Actual Celebrity (and even though Aguilera guested on the track, the song succeeded in spite of her, not because of her). The song was absolutely shameless with its Top 40 intentions, but fun and loose in a way that was nowhere to be seen on their last two albums. Inspired, the group entered the studio with every studio wunderkid they could find (Shellback, Benny Blanco, Max Martin), intent on not making a casual pop album as they did before, but instead crafting the most colorful, maximalist take on pop music they could possibly fine. Maroon 5, 2.0 (which makes them either 7 or 10, depending). This technicolor experiment starts with a curveball in the form of the casual reggae slide-along "One More Night", a breezy track wherein the chorus and the verse are largely indistinguishable from each other, the song existing on a permanent plateau, the drums dropping out during the pre-chorus serving as the only melodic deviation in the entire track, and even then, it's not much to go off of, making for a remarkably uninteresting start. The lead single, "Payphone", exhibits the group's strengths far better. "Yeah I know it's hard to remember / The people we used to be," Levine intones, and as he continues, there's an obvious resonance in his voice, light-years removed from, say, "Misery". In truth, the lyrics to "Payphone" come off as more thoughtful and considered than they have for the group in some time, and once that expletive-filled chorus hits, you really can hear a certain boldness in Levine's voice that wasn't anywhere to be found on Hands All Over. It's odd to describe his voice as being bold given how reedy he often sounds, but it doesn't take long to figure out why Levine is offering us such commanding performances: this time around, he's absolutely brimming with confidence. As the album goes on, certain, expected tropes are trotted out for the band to show off their newfound melodic prowess: "Daylight" is your big anthem that actually could've been a lot bigger had they not relied entirely on a thin drum palette during the chorus. "Love Somebody" is their sky-scraping Coldplay moment, and the astonishingly bold electronic number "Fortune Teller" explicitly caters to the dance crowd, albeit with heavier synths than anyone would've ever expected from the band (shame the whole thing is torpedoed by a chorus that is simply too light for the sonic foundation they lay out, Peter Hook basslines and all). There are some moments that come off as coldly calculated (the piano-and-voice ballad "Sad" does not play well with Levine's voice, as his vocals are just too showy to make the chorus of "I'm so sad" sound anywhere near genuine), and other bits that cop some unusual sources ("Lucky Strike" is basically a danceable carbon copy of Peter Bjorn & John's "Second Chance", imitating the latter song right down to the guitar tone -- it'd be a hell of an homage had it actually done something with it instead of merely replicating the original with more dance beats). No, these are not great songs, but these prove to be fascinating failures, showing the band eager to stretch out and try new things even if such experiments don't entirely pan out in the long run. Leave it up to the band to still surprise with a few stunners, as the late-in-the-game track "Tickets", which -- disjointed as it is melodically -- still serves as one of the most fascinating psychodramas the group has ever played out. "She's got tickets to her own show," goes the chorus, "but nobody wants to go," and with that fiery jumping-off point, the band just unleashes one venomous line after another ("You say you got a job / But I don't know what you do") before turning the struggle inward ("Stop messin' with my mind / 'cause you'll never have my heart / But your perfect little body ma-ma-makes me fall apart"). Although it's endlessly fun to speculate on who the band is talking about (as tends to happen with most any celebrity-baiting song of this nature), the bratty, sassy vibe of the track shows us an aggressive edge to the group that we haven't seen since, well, "Harder to Breathe". So while Overexposed features a whole variety of colorful styles, there's only real select moments we get wherein the group actually manages to pull out something memorable and meaningful. The album's deluxe edition then shows us what could've been: the group sampling Little Richard in a relatively creative fashion, a loose, bluesy cover of Prince's "Kiss" -- it's here that we see the band truly unleashed, having a lot of fun instead of forcing it on tracks like the rather forgettable "Doin' Dirt". 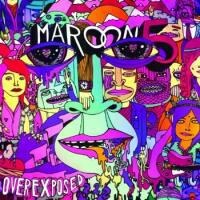 No, Overexposed is not a great album, but that doesn't mean it's not interesting. What we're hearing is the band actually learning to have fun again, and with any luck, they'll only get better from here.